5 storylines as the 2018 Breeders’ Cup approaches at Churchill Downs. For trainer Kenny McPeek, Darley Alcibiades (G1) winner Restless Rider and Princesa Carolina, fifth in the JPMorgan Chase Jessamine (G2), breezed in tandem at Keeneland Friday morning in advance of their Nov. 2 engagements in the Breeders’ Cup World Championships at Churchill Downs. Working after the morning renovation break, the duo stopped the clock in 1:01.40 for 5 furlongs. According to Keeneland clockers, they galloped out well in hand in 1:14.40 with splits of :12.40, :24.40, :36.20 and :48.80. Exercise rider Danny Ramsey was aboard Restless Rider, and jockey Brian Hernandez Jr. rode Princesa Carolina. Restless Rider, owned by Fern Circle Stables and Three Chimneys Farm, will be entered in the $2 million Tito’s Handmade Vodka Breeders’ Cup Fillies Juvenile (G1), while Princesa Carolina, who campaigns for Three Chimneys, is aiming for the $1 million Breeders’ Cup Juvenile Fillies Turf (G1). McPeek said the fillies will remain at Keeneland before shipping to Churchill Oct. 29 or 30. Restless Rider, a Keeneland sales graduate, won her career debut and the Debutante at Churchill in June prior to finishing second in the Spinaway (G1) at Saratoga on Sept. 2. She was a 2½-length winner of the Darley Alicibiades on Oct. 5 in her only other start. Princesa Carolina won her second career start at Saratoga on Sept. 3 before making a late rally to be fifth in the JPMorgan Chase Jessamine on Oct. 10. McPeek reported that Alabama (G1) winner Eskimo Kisses, seventh as the favorite in the Juddmonte Spinster (G1) on Oct. 7, will bypass the Breeders’ Cup Distaff (G1) on Nov. 3. KRA Stud Farm’s runaway 5½-length Claiborne Breeders’ Futurity (G1) winner Knicks Go completed his major training for the $2 million Sentient Jet Breeders’ Cup Juvenile (G1) on Nov. 2 at Churchill Downs by working 5 furlongs in :59.20 over a fast track Friday morning. Working on his own after the morning renovation break, the colt by Paynter produced fractions of :11.60, :23.20, :35.20, :46.80 and out 6 furlongs in 1:11.80. The time is the fastest of 19 works at the distance. Scheduled to work Saturday morning after the renovation break for Colebrook is Katherine Ball’s Limousine Liberal, who is expected to be pre-entered Monday in the TwinSpires Breeders’ Cup Sprint (G1) and the Breeders’ Cup Dirt Mile (G1). Breeders’ Cup, one of Thoroughbred racing’s most prestigious international events, today announces its first-ever digital docuseries. Titled “ALL IN: The Road to the Classic,” the seven-part series will debut on Facebook Watch on October 22 with subsequent episodes premiering over the following days. The docuseries will offer an exclusive, behind-the-scenes look at the competitive and career-making journeys of the owners, trainers, breeders and horses who strive to compete in the $6 million Breeders’ Cup Classic, which will take place on November 3 at Churchill Downs racetrack in Louisville, Kentucky. The Official Trailer for “ALL IN” is now available for viewing on the show’s Facebook Watch page at Facebook.com/RoadToTheClassic. Executive produced by celebrity chef and Thoroughbred owner and breeder Bobby Flay and his Rock Shrimp Productions co-founder Kim Martin, along with Hennegan Brothers Creative and Shelly Schulze, the docuseries will usher viewers through the most pivotal moments of the 2018 racing season leading up to the Breeders’ Cup Classic, including Justify’s retirement after his Triple Crown victory and major Classic division races such as the Haskell, Whitney and Travers. 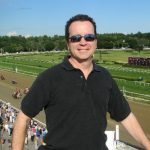 “ALL IN” will take viewers beyond the racetrack and behind the scenes into the personal narratives of both prominent industry figures, including Ken Ramsey and Barbara Banke, as well as newer contenders like Uriah St. Lewis, owner and trainer of Discreet Lover, and Chad Summers, part owner and trainer of Mind Your Biscuits. “ALL IN: The Road to the Classic” will premiere on October 22 on Facebook Watch and will also be available on the Breeders’ Cup YouTube channel. Fans can Follow the “ALL IN: The Road to the Classic” show page on Facebook Watch now to be notified when new episodes are released. With less than two weeks until the Breeders’ Cup World Championships returns to Churchill Downs for a record-equaling ninth nine, locally-based contenders Mind Your Biscuits, Seeking the Soul, Thunder Snow (IRE), Whitmore and Wonder Gadot logged their penultimate breezes for the Nov. 2-3 championship event on a chilly Friday morning beneath the historic Twin Spires.